The sympathetic division is also called the thoracolumbar division of the autonomic system because its preganglionic fibers exit the spinal cord from the first thoracic (T1) to the second lumbar (L2) levels. 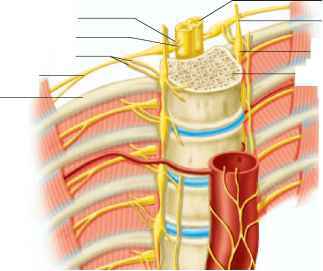 Most sympathetic nerve fibers, however, separate from the somatic motor fibers and synapse with postganglionic neurons within a double row of sympathetic ganglia, called paravertebral ganglia, located on either side of the spinal cord (fig. 9.2). Ganglia within each row are interconnected, forming a sympathetic chain of ganglia that parallels the spinal cord on each lateral side. The myelinated preganglionic sympathetic axons exit the spinal cord in the ventral roots of spinal nerves, but they soon diverge from the spinal nerves within short pathways called white rami communicantes. The axons within each ramus enter the sympathetic chain of ganglia, where they can travel to ganglia at different levels and synapse with postganglionic sympathetic neurons. The axons of the postganglionic sympathetic neurons are unmyelinated and form the gray rami communicantes as they return to the spinal nerves and travel as part of the spinal nerves to their effector organs (fig. 9.3). Since sympathetic axons form a component of spinal nerves, they are widely distributed to the skeletal muscles and skin of the body, where they innervate blood vessels and other involuntary effectors. Divergence occurs within the sympathetic chain of ganglia as preganglionic fibers branch to synapse with numerous post-ganglionic neurons located in ganglia at different levels in the chain. Convergence also occurs here when a postganglionic neuron receives synaptic input from a large number of preganglionic fibers. The divergence of impulses from the spinal cord to the ganglia and the convergence of impulses within the ganglia results in the mass activation of almost all of the post-ganglionic sympathetic neurons. This explains why the sympathetic system is usually activated as a unit, affecting all of its effector organs at the same time. ■ Figure 9.2 The sympathetic chain of paravertebral ganglia. This diagram shows the anatomical relationship between the sympathetic ganglia and the vertebral column and spinal cord. 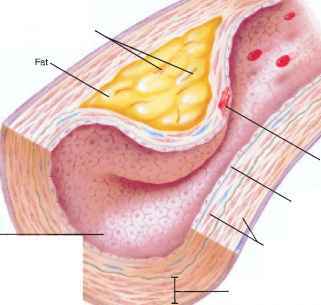 fibers that arise from the collateral ganglia innervate organs of the digestive, urinary, and reproductive systems. The paired adrenal glands are located above each kidney. Each adrenal is composed of two parts: an outer cortex and an inner medulla. These two parts are really two functionally different glands with different embryonic origins, different hormones, and different regulatory mechanisms. The adrenal cortex secretes steroid hormones; the adrenal medulla secretes the hormone epi-nephrine (adrenaline) and, to a lesser degree, norepinephrine, when it is stimulated by the sympathetic system. The adrenal medulla can be likened to a modified sympathetic ganglion; its cells are derived from the same embryonic tissue (the neural crest, chapter 8) that forms postganglionic sympathetic neurons. Like a sympathetic ganglion, the cells of the adrenal medulla are innervated by preganglionic sympathetic fibers. The adrenal medulla secretes epinephrine into the blood in response to this neural stimulation. The effects of epinephrine are complementary to those of the neurotransmitter norepineph-rine, which is released from postganglionic sympathetic nerve endings. For this reason, and because the adrenal medulla is stimulated as part of the mass activation of the sympathetic system, the two are often grouped together as a single sympathoadrenal system. Where is the ventral rami root? Why is the sympathetic division called the thoracolumbar division? What allows mass activation divergence? How many sympathetic chain in the body? What do nervous pathways in the white rami communicantes? Do sympathetic ganglia and the adrenal cortex arise from the same empryonic tissue? What is the sypathetic chain ganglia composed of? Is rami located the vertebrae? Where do we find the ganglia of each division? Where is the sympathetic chain of ganglia? Why are sympathetic axons in nearly all nerves? Which rami communicantes go to sympathetic chain? Is paravertebral sympathetic chain in spinal column? What sympathetic fibers form the splanchnic nerve? Which is a sympathetic collateral ganglion? Which sympathetic fibers form the splanchic nerve? Why is the sympathiec division called mass activation? Why is sympathetic division called thorocolumbar? Why are the paravertebral ganglia important in divergence and convergence of the sympathetic system? Which sympathetic fibers form a splanchnic nerves? Where do the preganglionic fibers of the sympathetic division exit the spinal cord? Why is the andrenal medulla considered to be a modified sympathetic ganglion? Is collateral ganglia in the symphathetic division.edu? Why is the adrenal medulla important in the sympathetic branch? Which part of the spinal cord is considered the sympathetic division? Why is the adrenal medulla innervated by the sympathetic division only? Which part of the spinal cord is considered the sympathetic divison? Where and how does the sympathetic nervous system have a high degree of divergence? What is the response of the adrenal gland when the sympathetic division is activated? Which part of the spinal cord is considered the parasympathetic division? Why is the suprarenal medulla considered to be a modified sympathetic ganglion? How does a preganglionic fiber travel to the adrenal medulla? Where do preganglionic fibers headed for the adrenal medulla travel in? Why is the sympathetic nervous system called thethoraco lumbar division? How do the preganlionic axons in the sympathetic division travel to the ganglia? Which of the below responses is NOT caused by the sympathetic division.? Why is the adrenal gland considered to be a part of the sympathetic divison? Why is the adrenal medulla innervated by the sympathetic division only and what is its roke? Where do postganglionic fibers exit? What is a splanchnic nerve how it relates to the collateral ganglia? Why is adrenal medulla likened to a sympathetic chain ganglion? What is the role of the collateral ganglia in the splanchnic route? How is the adrenal medulla likened to a modified sympathetic ganglion? What is the splanchnic sympathetic system? What are the division of the sympathetic chain ganglia? What the collateral ganglia innervate? How many ganglionic of the sympathetic system of the human body?